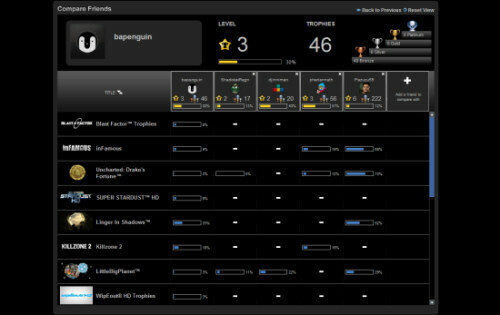 European PlayStation Network users have been enjoying this feature for some time, but now us North Americans can compare PlayStation 3 trophies via the official website. There's a host of new features to the site along with this, my favorite which allows you to compare trophies to multiple friends. Currently Jason leads our pack of staff members with 222 trophies, with the next closest "competitor" being Mike with 56. How do you stack up? Page created in 0.6069 seconds.